Where are the regular Christmas trees? By “regular”, I mean a) real, and b) not pruned and shorn into a tortured, stunted, overfilled cone. I’m already at a disadvantage when it comes the Christmas tree buying, because I was taught at my mother’s knee not to put up the Christmas tree until Christmas Eve (it’s a German thing, don’t ask). 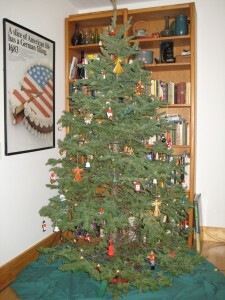 My mother, of course, was much smarter than I am, and she actually bought the tree immediately after Thanksgiving, when the pickings were good, and kept it in the carport in some sort of special sauce that was guaranteed to keep it moist and minty-green (she was a plant person). This year’s been a disaster all round since I’ve been traveling way too much. Friday as I got ready to leave home until the 22nd I mentioned to my beloved that he might want to go buy a tree in my absence. He looked at me quizzically and said, “Have you even seen a tree lot around town this year?” And I had to admit that I hadn’t. Are real trees totally passé this year? But my beloved girded his loins and went hunting, and brought back the best tree he could find, but it’s been so pruned that all the spaces between the branches are completely filled in and it’s going to be really hard to find spots for the candles. Candles? Good Lord! Perhaps you should put this baby out in the front lawn first … Flaming Bush of Christmas. Your post reminded me of my Grandpa- and his annual Christmas tree expedition. We’d go off into the woods on his nephew’s farm – tromp for an eternity – looking for the ‘perfect’ tree – by passing all of MY suggestions – then head back to the road and the car – with Grandpa cutting down something scrawny by the fence – and cutting boughs aplenty from neighboring trees. Once home, he’d haul out his ancient hand drill – bored holes in the trunk and inserted branches in exactly the ‘right spots’. Eureka! The ‘perfect’ tree with just the right spaces for ornaments. The tree would be put up on Christmas Eve – and left until New Year’s Day – so it’s not just a GermanThing – but perhaps a Finnish one as well. Thanks for provoking that memory – I miss that wonderful man – annnnd his goofy trees! Oh, ye of little faith! You will be disappointed. Well, I’m half german. I guess that explains why I haven’t gotten mine up yet. I blame it all on my own recent traveling. But, boy, I miss the scent of a tree. I don’t think I would ever be allowed to pick the family tree alone. I’d come back with something too short, too skinny and too practical.